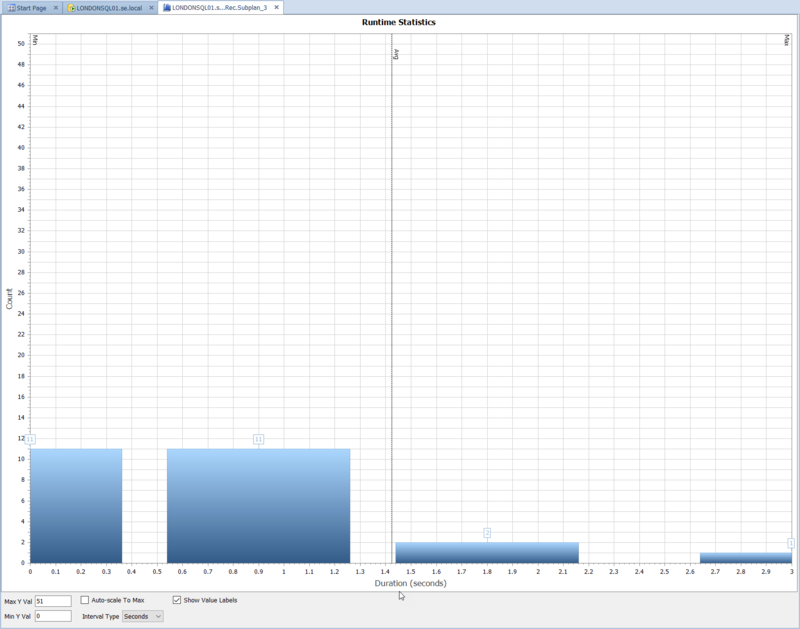 Right-click on the event object, select Jump To > Runtime Stats, and the Runtime Statistics graph appears. Select from the drop-down menu to choose between the Aggregate and History graph. These graphs make it easy to identify runtime trends that can be indicators of or eventually lead to performance issues with the event or server. This graph shows a job’s actual runtime and status over the specified interval. A red bar indicates that the instance failed. This graph shows the distribution of the job’s actual runtime over the specified interval. This data can be valuable when deciding where to place a job in the schedule to minimize contention. 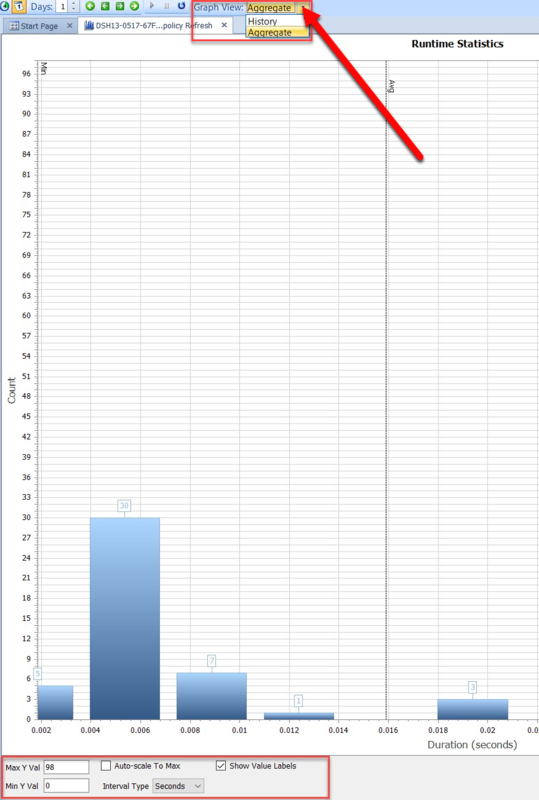 Use the Navigation toolbar to change the start date/time and interval for the graph. The Days control can go up to 60 days. Whenever the selected interval is less than one-day (1 minute through 4 hours), the Days control changes to one-day. Min/Max Y Val When a runtime graph is first displayed, SentryOne tries to determine the most appropriate interval and maximum Y-axis value. You can change either of these settings at any time. Auto-scale To Max Checking this box automatically selects the appropriate Max Y Value of the data being shown in the current view. Interval Type Changes the interval used for the Y-axis. Show Value Labels Deselect this checkbox to hide the bar value labels. This can become necessary for broader ranges with hundreds or thousands of bars to reduce the noise on the graph. Note: For information on the Top SQL runtime stats, see Top SQL runtime stats. 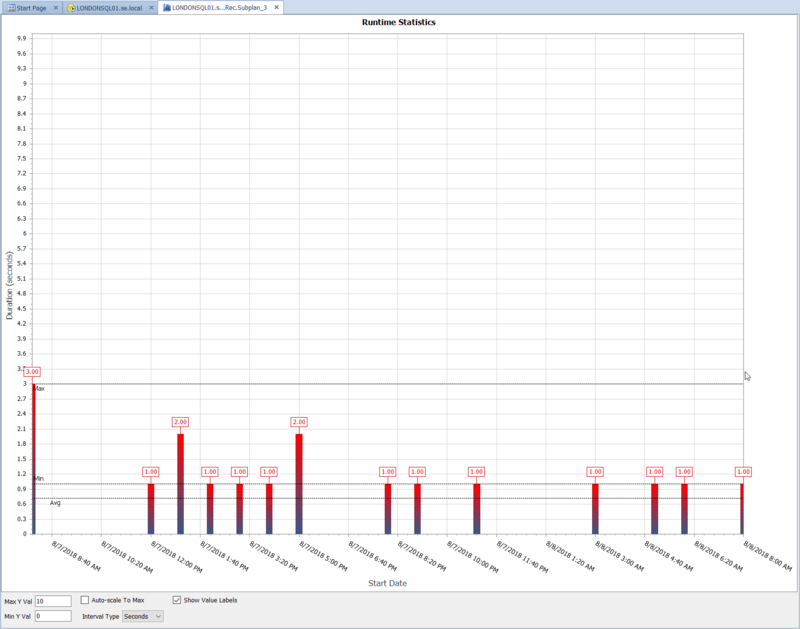 See the SentryOne blog post Have You Been Using Runtime Statistics? for an in-depth look at this feature.